These pan-seared lamb chops have the most delicious and easy brown sugar chili rub, and are served with couscous, and a peach-arugula salad. It’s a simple, easy meal that is ready in under 30 minutes! Disclaimer: Thank-you to the Ontario Sheep Marketing Agency for sponsoring this post! As always, all opinions are my own. What kind of cook are you? Do you hang onto those same tried and true recipes and make them over and over, or do you seek out new recipes outside of your ‘expertise’ to challenge yourself? I personally love to challenge myself in the kitchen. Sure, I have those recipes handed down to me from my mom that I make over and over. But in general, I like to be pretty adventurous in the kitchen. It doesn’t always work out for me. There have been some duds. But when it goes right, it can really really go right. One area that I am trying to improve upon is cooking meat. I used to sit back and let Ben cook the meat, but this summer I’m stepping up and trying to learn. First up was cooking the perfect steak. And when I had the opportunity to create a lamb recipe for Ontario Lamb, I jumped at this opportunity to improve my lamb cooking skills. So today, I’m serving up pan-seared lamb chops for us! Here’s what I know about lamb: Go to your butcher. Get the local stuff. Don’t mess around with that stuff that has been flown from across the world. It’s good for the farmers, it’s good for the planet, and it tastes SO much better. Take my word on this! I decided to try the super easy brown sugar chili rub from my Chili-Rubbed Salmon on the lamb…I know. Chili powder…on lamb? 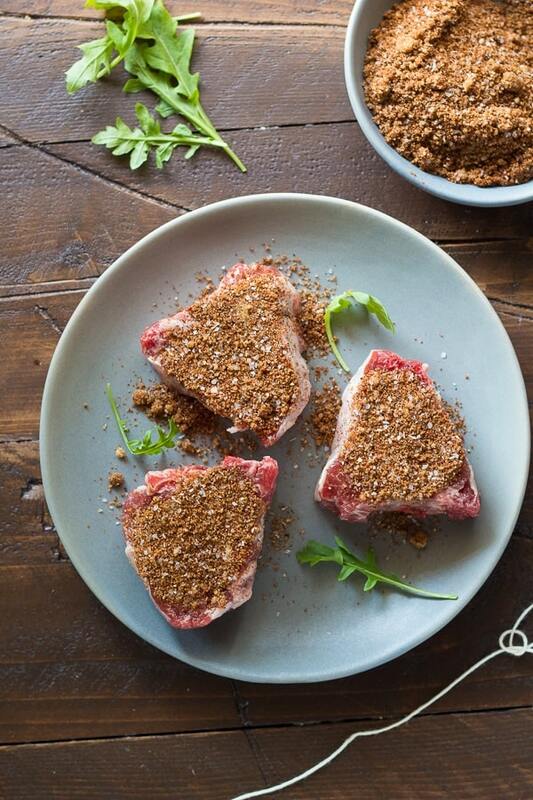 Well actually the predominant ingredient in the rub is brown sugar, and when brown sugar, chili powder and lamb chops come together, something magical happens. It’s a little bit sweet, a little bit salty, with a hint of the chili powder (not overwhelming). It just really works! I used my cast iron skillet for this one, because I’m still not convinced that our barbecue gets hot enough to get a good sear on meat. I heated up some vegetable oil nice and hot, then cooked the lamb 3 minutes per side. 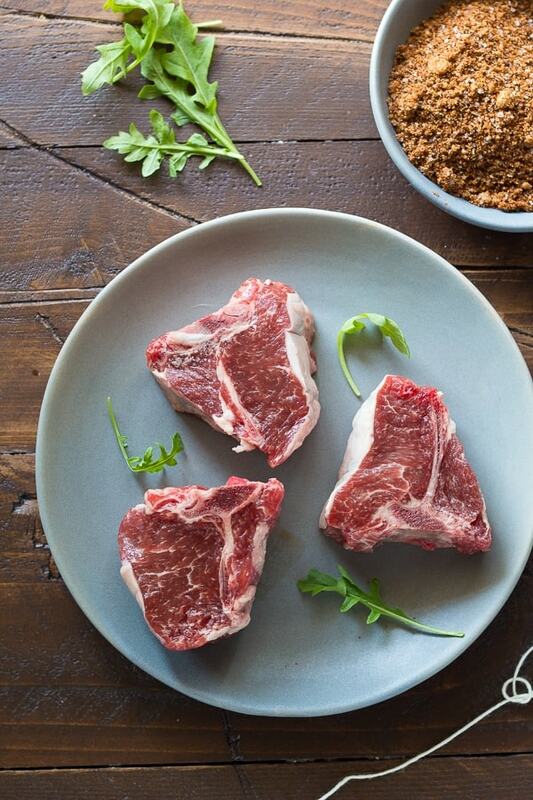 Our chops were pretty small, so you’ll need to cook larger chops longer to get those perfect pan-seared lamb chops. Here’s an awesome chart to help you decide how long to cook your lamb. One thing to note is that this brown sugar chili rub will blacken as it cooks, but it isn’t burnt…it still tastes wonderful. So don’t worry that you’ve burnt your chops, it is probably just the rub. 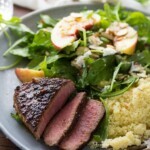 I’ve gone on so much about these delicious pan-seared lamb chops, I almost forgot to tell you about the salad! 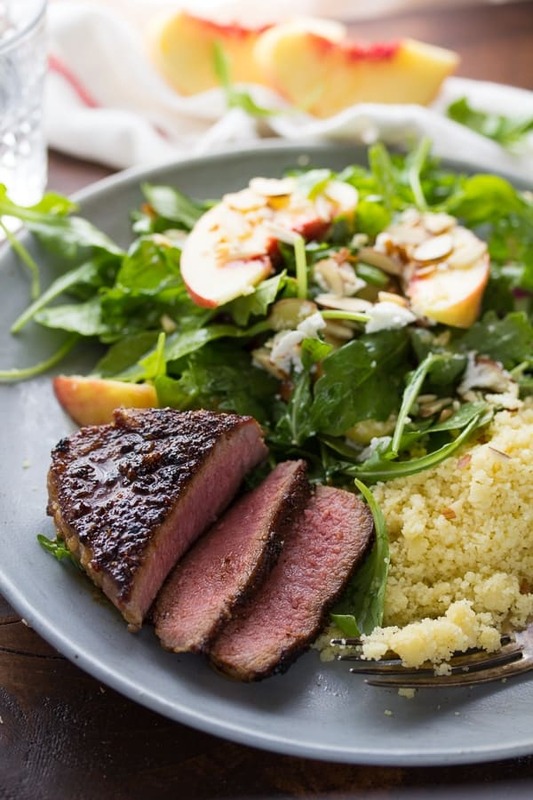 An arugula salad with fresh peaches, goat cheese and sliced almonds…it comes together in minutes and totally compliments the brown sugar chili lamb. We also served ours with couscous, which is delicious served on the side or mixed into the salad. I feel like this meal is a little bit adventurous without having to leave the comfort of your home or slave for hours; it’s ready in under 30 minutes! I love it when delicious food is easy to make. Happy Tuesday! 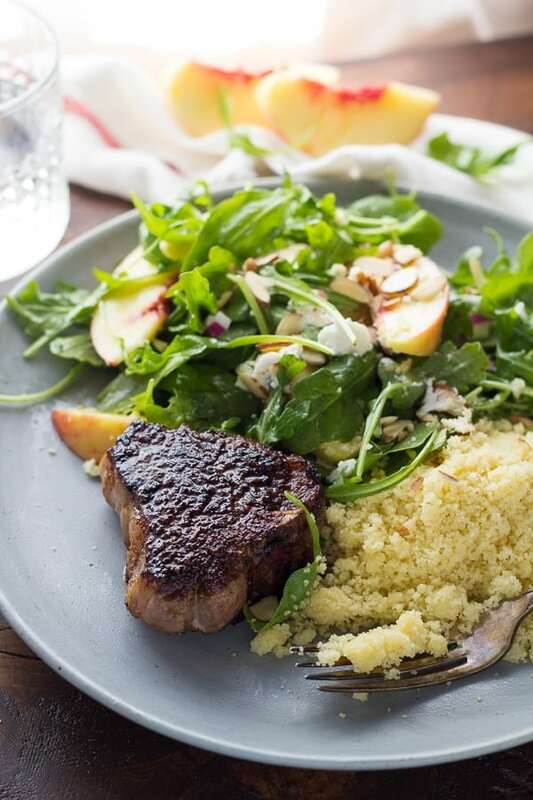 These pan-seared lamb chops have the most delicious and easy brown sugar chili rub, and are served with couscous, and a peach-arugula salad. It's a simple, easy meal that is ready in under 30 minutes! Cook couscous according to package directions. Set aside to cool. Shake together all vinaigrette ingredients. Generously spoon the rub over both sides of the lamb chops, pressing gently with the back of a spoon. Heat a medium skillet over medium-high heat. Add just enough vegetable oil to coat the bottom of the pan. Heat the oil quite hot; when a drop of water is flicked in, it should hiss. Add the lamb and cook for 3 minutes per side (see note). Let the lamb rest for 5 or so minutes before serving. Cook time will depend on the size of your lamb chops. See this chart for directions. I don’t make lamb NEARLY enough considering it’s my hubby’s favorite protein! Yours looks so perfectly cooked and the rub sounds amazing! You can’t go wrong with sweet ‘n spicy! I do like to challenge myself in the kitchen, Denise, but only if it doesn’t take too long 😉 … so this recipe is just perfect for me! This recipe sounds wonderful in every way, and I love that it was developed for the sheep marketing agency!! You have inspired me! I have never cooked lamb. I’ve ordered it and had it at restaurants, but never cooked it myself. I’m going to need to change that asap, starting with this recipe which sounds DELICIOUS! You’re so right about lamb — it needs to come from the butcher! It tastes so much more fresh that way. And I used to leave the meat cooking and grilling to my husband until he started getting home too late for my taste — the best thing I did was learn to do that! Good for you, and for us! haha This lamb sounds delicious with that sweet & spicy rub and those sides…what a great meal! That rub sounds so delicious, Denise! It’s breakfast time, but I could totally go for one of these lamb chops right about now. They look so perfect! Sorry if I am late to the game, but I LOVE your new look! This salad looks incredible too. Those lamb chops are calling my name! I love the rub on this lamb and the peaches are so refreshing 🙂 Love! I am all about arugula salads, especially in the summer! I love the addition of peaches, Denise! And that lamb looks fantastic, too. What a great idea to season it with brown sugar and chili powder. Sounds delicious! Me too! We almost never ate arugula before this summer, but I’m loving it! Thanks, Gayle!